The apartment comprise airy living room and dining room with open plan kitchen, one bedroom and one full bathroom, All rooms with central A/C and floor heating systems, it is arranged on middle floor that tenants could enjoy nice view of Beijing city center. The apartment in Gemini Grove is available for rent now. 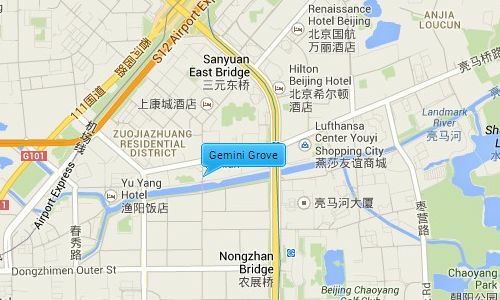 Gemini Grove is located in the Lufthansa area which is popular amongst expats. It is next to a major embassy area; it is also near to both the airport expressway and the 3rd ring road, giving it easy access to the city airport and other main destinations. Lucky Street famous for its many international restaurants and Solana shopping mall where the rich and famous like to shop are around the corner, and Lady Street, a huge indoor market where you can pick up plants, clothes, authentic Chinese furniture and much more is only up the road. Gemini Grove has a total construction area of 46,440sqm and contains 2 well built residential tower blocks east and west, which contain over 300 apartments. The apartments range from a 70sqm 1 bedroom layout to a 255sqm 3 bedroom layout. The compound has been described as a piece of paradise in the heart of Beijing.